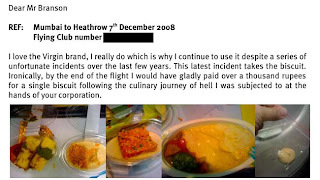 VIRGIN boss Sir Richard Branson has thanked the author of a 1000-word tirade - complete with embarrassing photos - that slates food onboard a Virgin airlines flight as a "culinary journey of hell". The anonymous email - which has whipped around the internet - is described by the UK Telegraph as one of the best airline complaints in the world. Opening the lid of the main meal was like being given a "dead hamster as a Christmas present", it says. The disgruntled passenger fired off the missive to Sir Richard after a disastrous flight from Mumbai to Heathrow on December 7 last year. “Imagine being a 12-year-old boy Richard," the email says. "Now imagine it’s Christmas morning and you’re sat their with your final present to open. It’s a big one, and you know what it is. It’s that Goodmans stereo you picked out the catalogue and wrote to Santa about. Only you open the present and it’s not in there. It’s your hamster Richard. It’s your hamster in the box and it’s not breathing. That’s how I felt when I peeled back the foil and saw this (see image 1). The complaint continues: “…It’s mustard Richard. MUSTARD. More mustard than any man could consume in a month. On the left we have a piece of broccoli and some peppers in a brown glue-like oil and on the right the chef had prepared some mashed potato. The potato masher had obviously broken and so it was decided the next best thing would be to pass the potatoes through the digestive tract of a bird." 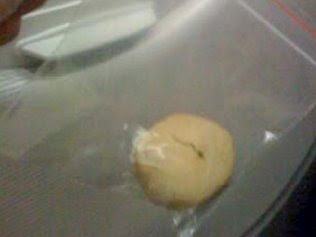 The passenger also complained about the size and “baffling presentation” of the "criminal" cookie he was served (see image 2). “It appears to be in an evidence bag from the scene of a crime. A CRIME AGAINST BLOODY COOKING. Either that or some sort of backstreet underground cookie, purchased off a gun-toting maniac high on his own supply of yeast." The dessert was just as bad, with the passenger asking: "What sort of animal would serve a desert (sic) with peas in (see image 3)?" 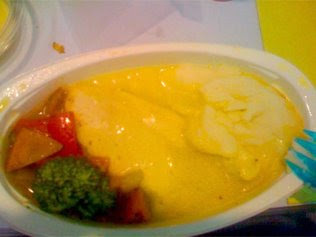 “I know it looks like a baaji but it’s in custard Richard, custard," the passenger wrote. "It must be the pudding. Well you’ll be fascinated to hear that it wasn't custard. It was a sour gel with a clear oil on top. It’s only redeeming feature was that it managed to be so alien to my palette that it took away the taste of the curry emanating from our miscellaneous central cuboid of beige matter." I laughed so hard I cried. Thanks.